CEREC is an exciting technology that has been around since 1980. For over 30 years it has allowed over 38,000 dentists to do high quality Ceramic restorations in in a single visit. It uses a powderless camera the size of an intraoral camera to digitally scan the prepared teeth, meaning no goopy impressions to gag on. 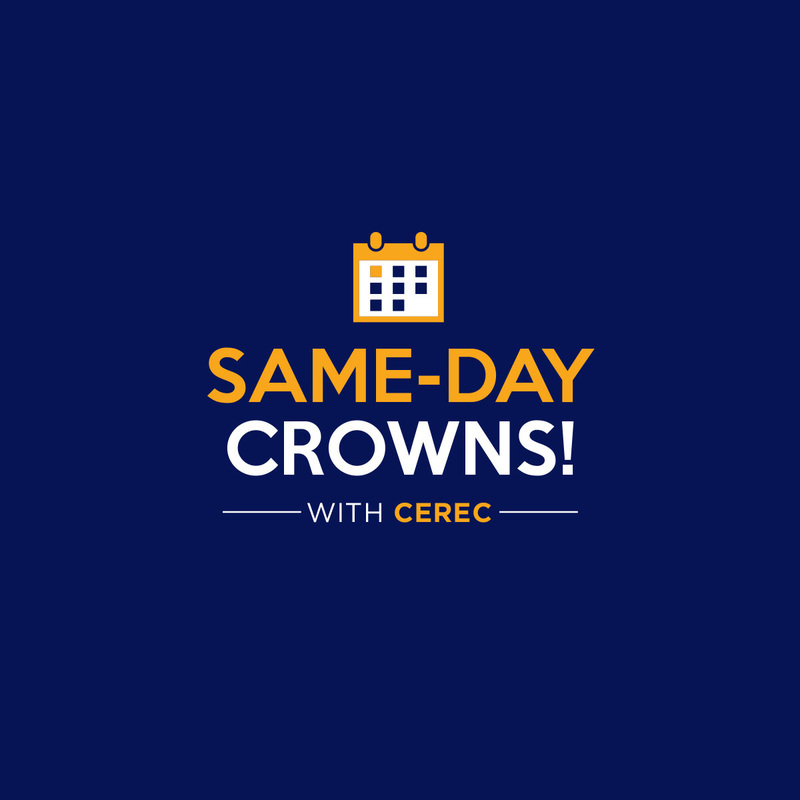 The crown is then designed using the highly intuitive software that uses a biogeneric process, meaning it's taking data from the surrounding teeth to create the most beautiful life like tooth that looks like it naturally belongs. After its designed, it is then milled in approximately 10 minutes from a porcelain block (Empress, e.Max, Zirconia etc) that is biocompatible and boasts tooth-like physical and aesthetic qualities . Its is then either polished and bonded in or glazed and fired in an oven to give it that lob like finish. It is capable of creating just about any type of restorations including crowns, veneers, inlays, onlays, bridges, custom abutments and implant crowns. You can choose to either mill in-office or send to your preferred lab. You can scan Invisalign and Clear Correct cases digitaly. WHAT IS THE BENEFIT TO THE DENTIST? Simply put, total control! One of the most frustrating parts of doing a crown is dealing with the lab getting your margins, contacts and occlusion right! You have control of timing, getting it finished in a single appointment. If there is a problem with the crown when it comes back from the lab it means wasted time for you and your patient. You won't need to take impressions and deal with gagging patients, or labs sending you back your impression because you had a bubble or distortion. No more making temps... no more temps falling off! You have total control over the process, and once you experience that you will wish you made the decision to get Cerec earlier! Last but not least, Cerec will add an excitement and passion back into your job that you haven't seen since you graduated. You will hear from users that this was life changing decision and that you should just do it, you will love coming to work again! ​Single visit dentistry is the standard in dentistry today, there are zero patients that WANT or enjoy coming to the dentist more than they have to. Your patient does not want to hear from their best friend that they got their crown in a single visit after they just went through the "old" way. Your patients do not want "goop" in their mouth. They do not enjoy temps falling off the night before Thanksgiving. They do not want you to cut their natural tooth any more than what is necessary, this becomes possible with conservative preps that allow you to do inlays and onlays. Your patients will be excited watching their tooth "being made" right in front of them, this is marketing magic! They will take pictures of their tooth being milled and post it on Facebook! Patients will refer their friends to you as a Cerec dentist so they can save their friends time, not having to miss work for 2 or 3 visits. To help my customers make the decision if Cerec is right for them, we need to discuss 3 important questions before moving forward with the technology. ​Does it work clinically? This one of course is easy, YES! I usually don't have to answer this question today since its been clinically proven and studied more than just about any product in dentisty. Emax and Zirconia are the most commonly used crown materials in dentistry today. Question 2 Will it work in your office/are you "mind ready"? This one is very important and requires us sitting down to discuss whether you are ready for this change. The technology is here, but it does require that you are ready to put the time in to learn the technology. The last thing I want is to put a Cerec in one of my offices just to take it back because you weren't ready. Question 3 ROI (return on investment), to me this one is the most important. I start with running an ROI analysis based on your numbers over the last 12 months. We will review this together to make sure this is not an expense but a PROFIT CENTER for your practice! You have to change your thinking when researching a product like this. You can' think of this as a $100k on a piece of equipment, you are making a monthly payment, eliminating your lab expense. So if your lab is $3,000/month and your monthly payment is $2,300, you have just lowered your overhead by $700 per month, and we haven't taken into account all the things that you can do with Cerec that you can't do now, such as doing a custom abutment and crown for around $160 vs the $600 you currently spend. You will free up all 2nd appointments, and at $300/hour production, just 10 units per month is $1,500 in extra production time.